The summer before senior year in high school can be a stressful time for your teenager. College is on everyone's mind and the application process is looming ahead. Lots of families hit the road for college visits across the country. But all that travel can add to the pressure and put a drain on your wallet. So, now that I am doing this whole college thing with my third child, here are a few things I can share. A college visit is a chance to spend some quality time with your child. He or she may be heading away for the next four years. Even if they go to college locally, they are going to be pretty busy – so make sure to relax and have some fun on your trip. It may be necessary to combine a few of your college visits with a family vacation. But if you can swing it, leave the rest of the family at home and hit the road with your soon to be graduating senior. You will get to focus your attention on one person and on the college itself. The one-on-one time is fabulous, and you don't have the stress of attending to your other children. Honestly, college visits can be a little boring for siblings – even if they are also in high school. If the siblings are not into it, then they are going to complain – and that can be a drag. If the college you are visiting is in a new city or area that you have never been to before, try to build in an extra day to do some sightseeing and to visit friends that you might have in the area. Those side trips will make your trip more memorable for both you and your child. Also, it can help your child make a decision on whether they want to attend the college that you are visiting. If they end up with two or more equal acceptances then location may end up being the deciding factor. Catching up with old friends is great, too. And should your child decide to attend college in the area, they also have established a local connection. If you are heading far from home – consider visiting a few colleges in one trip. 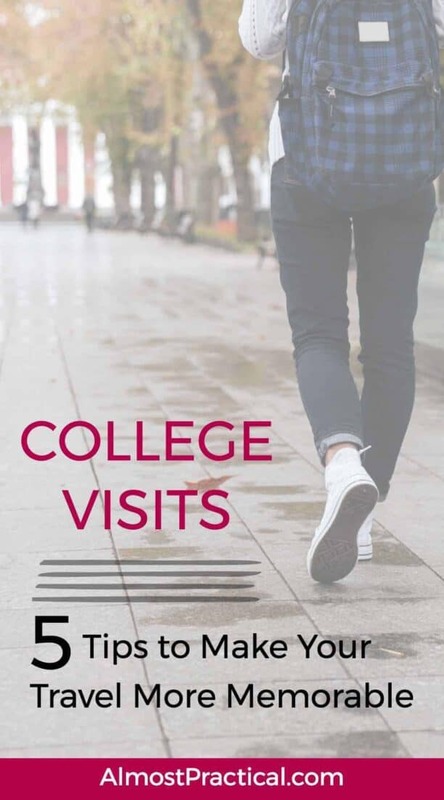 Generally, you will find a few colleges along your path, so even if the ones you pass aren't on your list of favorites – you should consider signing in and taking a quick tour. You may be surprised at the gems you find. The summer may seem jam packed. You probably have to juggle your work schedule and that of your teen – but I have found the fall to be even busier. So block out the time, take the road trip, and meander your way to the schools that are furthest away. In the fall, you can hit the closer colleges on a weekend day trip. I recently returned from a college visit with my son – just the two of us. We had so much fun and we also visited a good friend of mine that lives in the area. No matter what happens in the college process, this trip will be one that both my son and I remember forever. Amazon Prime Student: Get a discount on Amazon Prime for your student.